Today was insanely busy ~ sorry I never made it back to show you all some love. But, I am here now with MORE RECIPES w/fantastic pictures and that’s all that matters, right?! 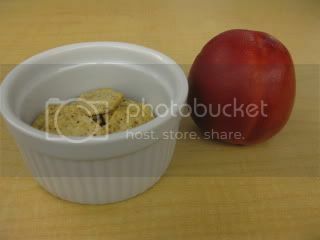 🙂 LOL….I brought a nectarine for my morning snack but decided to add some TJ’s Organic Wheat/Flax Crackers to help it stick with me longer (in all honesty) – I had the crackers x’s 2 – so addictingly good. Meditation came at a funny time today. The instructor to Body Sculpt was 10 minutes late so I used the time to be still and meditate (sleep). The class was amazing today because she was on turbo mode after feeling like she let us down. I knew I was in trouble when my legs were burning during the warmup! 200 calories burned strength training – yahoo! I came back to a fantastic lunch. I mixed together the chickpeas through salt/pepper and poured them over the spinach. 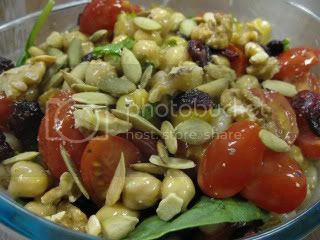 I topped everything off with the berry blend, walnuts and pumpkin seeds. In all honesty, I wasn’t sure I’d like this salad, but, I actually LOVED it. All together with my favorite fizzy water of all time made by the Penguin Machine – I drink like 5 glasses of this stuff a day – it rocks! 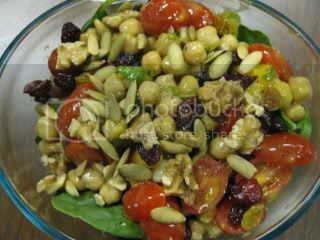 I LOVED the nuttiness of the salad along with the sweet berry treats. I’d definitely make it again for a nice switch from a balsamic/olive oil salad. Ok ~ now comes my confession time. I have been craving sweet things ALL week long *sigh* and today I felt like I had “earned” some dark chocolate. 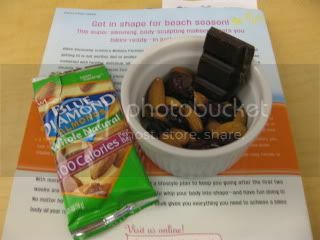 So, with my healthy Bikini Bootcamp Snack I had a little bit of Organic 72% Cacao Dark Chocolate (yeah for healthy Antioxidants :o) It was amazing and I savored EVERY bite! Coming up next, my Indian Inspired Bikini Bootcamp Dinner and our fridge update! « Breakfast on the fly…..
You're doing great with this challenge, and definitely deserve a little treat 🙂 Yummy chocolate! anything with garbanzo madness is wonderful in my mind! and did you say double to TRIPLE workouts? you are on fiya! Where do you get ur flavored water from??? I would love to get another type of water… I am getting bored with the same old stuff!! Anne ~ Thanks! You know I think that was the part that seemed wierd to me too. However, the saltiness of the nuts and the chew of the berries really went well with it. 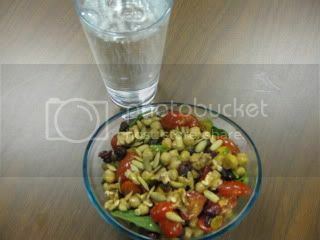 Janetha ~ I LOVE chickpeas too! I sure hope all the working out on this challenge is doing some good. Learning to cope ~ I LOVE Arrowhead Sparkling Water the best – the orange, lime and lemon flavors rock. Perrier is awesome too. I really want a Penguin Machine to make my own – maybe some day.